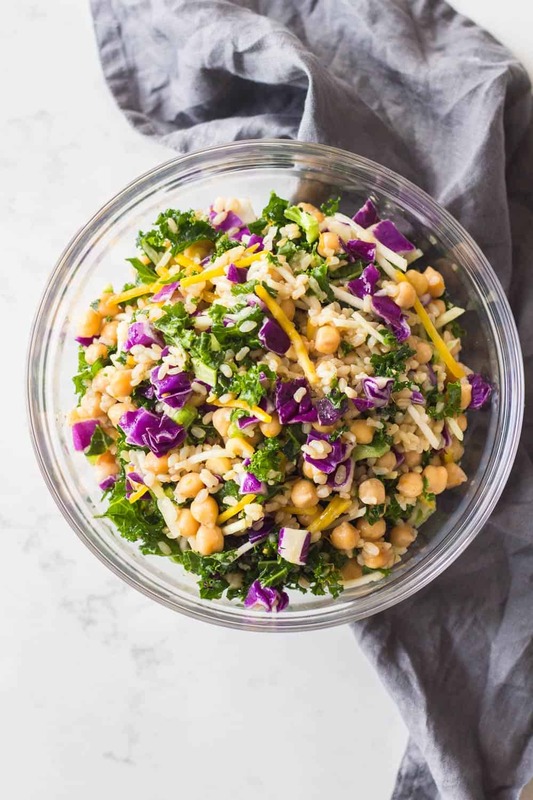 A brown rice salad with delicious chickpeas, a blend of kale and beets and a zingy orange ginger dressing! Eat it cold or warm, either way it’s extremely delicious! 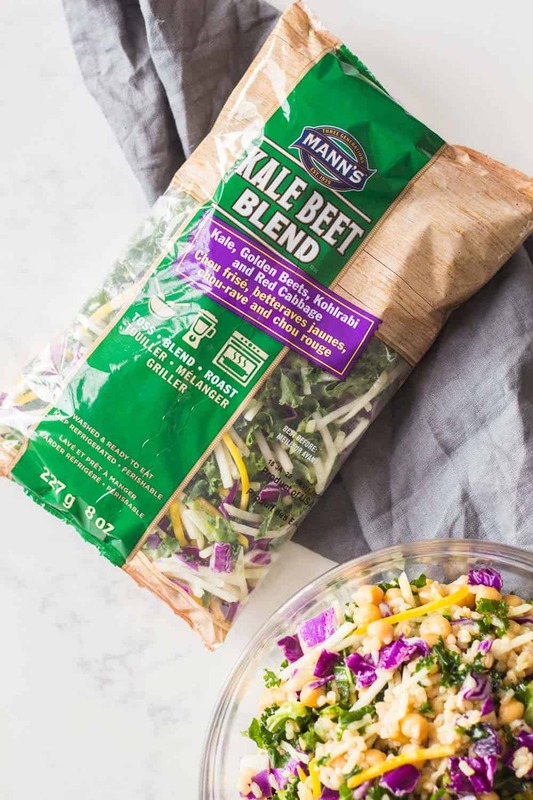 Pressure cook the brown rice and chickpeas together at the same time and use Mann’s Kale Beet Blend to save on time and throw this together in just half an hour. Rice is hands down my favorite grain of all. I love it plain but I also love it mixed into bowls with many other deliciousnesses and luscious sauces or dressings. 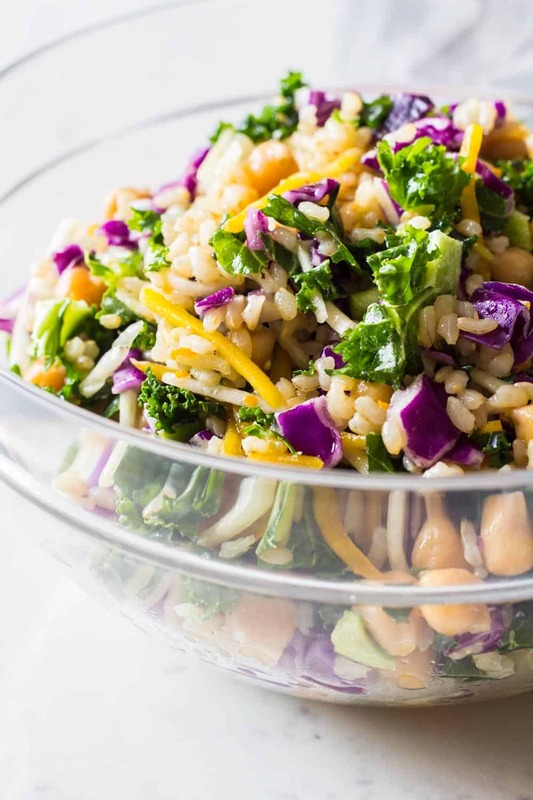 This Brown Rice Salad can absolutely be served as main dish thanks to the chickpea’s protein and massive amounts of veggies. It’s also a great salad to prepare as meal prep, to take to work all week. Kale and beets are amazing vegetables that hold their shape really well for a long time in the fridge. For meal prepping I recommend to let rice and chickpeas cool down completely. Toss rice, chickpeas and veggie blend together and store the dressing separately. This way the salad can easily be stored for up to 4 days in the refrigerator. 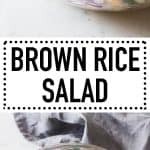 Cold brown rice salad happily waiting for you every day at lunch time. This has been the most amazing discovery ever for me. In the pressure cooker you can actually cook both at the same time in just 22 minutes (+natural pressure release). Mind-blown? Yah, me, too! Add an equal amount of rice and water, add soaked (!) chickpeas, a bit of sea salt and that’s it. Get your pot to pressure and pressure cook on high for 22 minutes, then wait for the pressure to release naturally and that’s all the magic. If you’ve been following Green Healthy Cooking for a while now you probably know by now that I’m a huge fan of their products and especially their slaws. They make adding vegetables to your meal so much easier. Struggle eating enough vegetables in the morning? Make some prep ahead Breakfast Burritos with one of Mann’s slaws. Wish your dinner contained a lot of vegetables? Make a delicious Chicken Spaghetti Squash LOADED with broccoli slaw and call it a night! 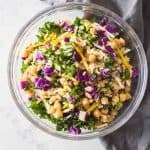 A brown rice salad with delicious chickpeas, a blend of kale and beets and a zingy orange ginger dressing! Eat it cold or warm, either way it's extremely delicious! Soak chickpeas overnight. Then drain and rinse. Add brown rice, soaked chickpeas, 1 cup water and sea salt to pressure cooker. Turn valve to sealing position and pressure cook on high for 22 minutes. Then let pressure release naturally. (Do NOT turn valve to venting position, just let pressure release naturally). In the meantime, prepare the dressing by zesting the orange, adding juice of half an orange to a sealable jar, add zest, ginger paste, avocado oil and salt and pepper and shake vigorously. Assemble the salad by adding brown rice and chickpeas, Mann's Kale Beet Blend and dressing to a bowl, toss well and serve. For meal prepping: Wait for brown rice and chickpeas to cool down completely before tossing together with Mann's Kale Beet Blend, divide into 4 meal prep containers. Prepare dressing and store separately. Toss with dressing minutes before serving. I am looking to make this but I don’t have a pressure cooker. Is there another way that I can cook the chickpeas and rice? Hi Krystal, yes absolutely! Soak the chickpeas 12 hours just like for the pressure cooker version and then cook brown rice and chickpeas in a regular pot for approximately 1 hour. Use 1 cup brown rice, 1 cup chickpeas and 2.5 cups water, bring to the boil and once boiling immediately reduce heat to low and cover with a tight sitting lid and let simmer for an hour. Sounds yummy! I love chick peas! I’ve tried to get your Instant Pot cheatsheet but to no avail. When I click on the link in the subscribe email it goes to a blank page? Hi Julie, I’m confused, after you enter your name and e-mail you’re supposed to get an e-mail stating “Thanks for signing up. 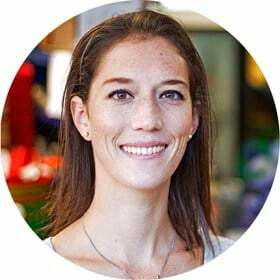 Click the link below to confirm your subscription to Green Healthy Cooking’s Newsletter and get to the Instant Pot Cheat Sheet!” You click subscribe and should then be lead to the option to download the cheat sheet. It never worked? Anyway, I just sent you the cheat sheet manually via e-mail because the subscription process definitely worked. You are on my list now. This recipe looks amazing! As far as the fat content, is that accurate? 18 grams of fat per serving? Other than the avocado oil, which is not a huge amount for a salad this size, I don’t see anything else in the recipe that would add that many grams of fat. Hi Christine, thank you :) It really is delicious! In reference to the fat, yes 18g per serving is a little off but not too much. I just double checked on the bottle of my avocado oil and it says 14g per Tbsp. This salad gives 4 servings and the dressing contains 4 Tbsp oil, so it would actually be 14g not 18g. The nutritional calculators all just offer estimates. Please never go off of them 100%. They are just a guide.